The title of this post is somewhat ironic. I’ll explain why at the end. We like to show our guests important ancient sites they would not find, or find difficult to engage with and to appreciate properly, by themselves. One of those sites is Stari Grad Plain on the island of Hvar in Croatia. It is a unique place, of immense historic relevance, and it is still rarely noticed or visited, in spite of having been a UNESCO-listed World Heritage site since 2008. 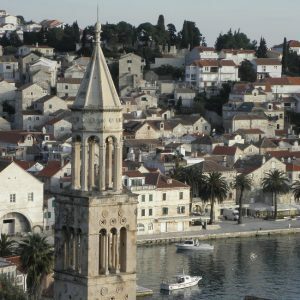 We give it the attention it deserves on Walking and Cruising Southern Dalmatia, a tour that engages with the history and the landscape of the region in a unique way. Stari Grad Plain, with the island of Brač in the background, as seen from the southeast. The port of Stari Grad, ancient Pharos, as it looks now. If you make your way to the island of Hvar off Croatia’s Dalmatian Coast, you will most likely see the town of Hvar. It is interesting, has some good examples of Venetian architecture, and much else to see – and it is buzzing with party life during summer and virtually dead in winter. That’s all fine and fun, but there is more to the island. Only 13 kilometres (or 8 miles) away from Hvar Town (as the crow flies) is Stari Grad, its name meaning ‘old city’. Stari Grad is a beautiful and tranquil town, much less affected by mass tourism, with a visibly medieval core, set at the head of a long and sheltered inlet penetrating the island’s northern coast. It is also a very, very old settlement. Stari Grad is literally the ‘old city’, the town that already existed when the Venetians founded what is now Hvar Town, back in the 13th century. Its origins are actually 17 centuries earlier, in the fourth century BC, when Hvar was colonised by Greek settlers from the Aegean Greek island of Paros. They founded a small city and called it Pharos, the origin of the island’s modern name, Hvar. The foundation is recorded by the Greek historian Diodorus, who places it in the year 384 BC and notes that the Parians were assisted by the Syracusan tyrant Dionysios, as he was hoping to increase his influence over the Adriatic. Stari Grad has not seen much excavation so far, but the little work that’s been done reveals segments of a walled Greek town and its Roman continuation and is presented in no less than three local museums. Bucolic: Peter Sommer at work in one of the ancient lanes of Stari Grad Plain, while some of its modern inhabitants pass by. When first noted, this field system was suspected to be an example of centuriation, the Roman habit of subdividing agricultural land in conquered territories into regular parcels to be distributed to army veterans in lieu of a pension. Examples of this are visible in various landscapes of the Mediterranean, dating from the 2nd century BC onwards – but the Roman system is invariably based on land units that are square. Moreover, the 181m base unit used at Stari Grad is conspicuously similar to the stadion, the principal Greek base unit for long distances, which varies regionally, but is often equivalent to about 180m (based on the 176m stadium at Olympia, ascribed by tradition to the mythical hero Herakles/Hercules). Careful study of Stari Grad Plain, comparison with other areas and limited excavations have revealed the astonishing truth: the field system of Stari Grad Plain, in use to this day, is the parcelling of land undertaken at the point of the foundation of the Greek city of Pharos in 384 BC. Its modern Croatian farmers walk the same tracks, respect the same boundaries that were established then – to a considerable extent they also grow the same crops and thus follow the same annual calendar that was introduced here over 2,400 years ago. Apparently, the Greek system was so well thought-out and appropriate to the land’s potential that it never required major changes in all those years. Moreover, settlement and agricultural practice in the area must have been so stable over the millennia that the system never fell out of use. Peter exploring an ancient olive press at the Roman villa of Kupinovic in the southwestern part of Stari Grad Plain. Visiting the Stari Grad Plain is a bit of a conundrum for us. Although we are looking at one of the most astonishing cases of continuity on any of our tours, and at one of the most extensive ancient monuments in the world, it is rather like the story of great-grandpa’s axe: it’s been in the family for over a hundred years, but the handle has been replaced a few times and so has the blade – no individual part is actually as old as the whole thing, but the whole thing has been around and has been used for all that time: that’s exactly why every part of it has been renewed whenever necessary. The field walls and pathways and the fields themselves that define Stari Grad Plain all have an appropriate air of age to them, but we should not assume that any individual feature we see among the fields is actually 2,401 years old (I am writing this in 2018). It is possible that the occasional wall goes back that far, or – more likely – the occasional cobbled surface of a pathway. But that is not the point – it is the overall arrangement and alignment of the fields that make Stari Grad Plain so unusual and so significant. There’s another problem: the plain is flat. There are no easily accessible vantage points to see all of it and to appreciate the field system – but we have found one that we can use. That said, it is certainly recommended to also look at aerial pictures, such as the one, courtesy of Google, above. Vines near the centre of Stari Grad Plain. So, the main monument at Stari Grad Plain is very real, but nearly intangible: its most astonishing reality is that today’s farmers follow in footsteps so old. The paths they walk and the daily, monthly and annual rhythms they follow were established in this very spot nearly a hundred generations ago, by people who spoke a different language, had different names and worshipped different powers… The best place to appreciate all this might be the omphalos, or navel, the central point, nearly in the middle of the plain, from which the surveying and laying-out of the field system must have started. How do we know this? 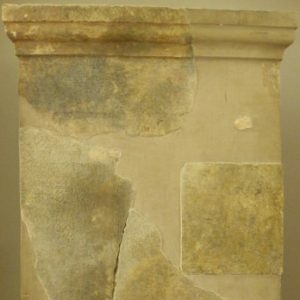 Because nobody’s perfect: although Greek surveying techniques, using an instrument known as the Roman groma (one of many Roman ‘loans’ from the Greeks) was quite precise, it was not utterly so. The Stari Grad field system has slight irregularities, basically surveying errors, and they allow us to trace back where it must have begun. Ever logical and practical, the settlers chose a central spot with visibility across virtually all of the plain. Close to it is a modern airfield, perhaps the only example worldwide of a runway that had its orientation defined in the 4th century BC! The boundary stone of Mathios, from Stari Grad Plain. Another key monument is an inscribed boundary stone, perhaps of 4th or 3rd century BC date, simply stating “Oros Mathios Pytheo”, meaning “border [of the land of] Mathios [,son of] Pytheas”. It is now in the museum of the Dominican Friary in Stari Grad Town. 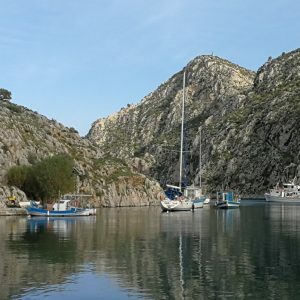 The existence of such a named definition of ownership is in itself typical of Greek lands, and perhaps a reflection of the common conflicts or disagreements that might arise within such an agricultural community. Of similar significance is the tombstone of a Greek lady named Selino, found in the Plain. A third important inscription records a psephismos, a redistribution of lands after the Roman conquest of Pharos/Hvar, a little before 200 BC. Grouped around the plain are a few definitely Greek monuments, namely three watchtowers, probably a defence system for Pharos and its hinterland – we have good historic evidence for conflict between the Greek settlers and the local Dalmatian natives, especially in the early years of Pharos. Diodorus Siculus reports that in 383 BC, the local Illyrian tribesmen, installed in a strong fortification on the island and resenting their new Greek neighbours, called on local allies to drive them out, but were defeated in the first recorded naval battle in the Adriatic. Eventually, they appear to have settled into some kind of coexistence, presumably based on mutual trade. Probably recent, but timeless: a corbelled stone shelter or hut near the centre of Stari Grad Plain. There are other cultural artefacts in Stari Grad Plain. Here and there, excavations have revealed parts of Roman villae or farmsteads, indicating the smooth continuity from Greek to Roman usage of the land, perhaps even by the same families, after the Romans conquered Hvar/Pharos in 218 BC. A number of corbelled huts, temporary shelters for herders and farmers, are literally timeless. They are such simple structures that we cannot attempt to date them, they are as likely to be from recent centuries as they might be from deep antiquity. There are also a few churches, none of them strikingly old, but some including carvings that may go back to the late first millennium AD, when the new Slavic settlers of Dalmatia were gradually converted to Christianity. There are a few abandoned villages, last inhabited in the mid-20th century, adding atmosphere to the place. The keen observer will find fragments of pottery all over the plain, bits of tiles, storage vessels and transport vessels, dating from the entire period of its use, from the Greek pioneers to the late 20th century, until the advent of plastic deprived our material culture record of such durable and attractive remains of day-to-day life. Standing among the fields of Stari Grad Plain, it takes very little imagination to envisage how they were used and what they looked like fifty years ago, or a hundred, or a thousand, or more. Exploring the foundations of the Greek watchtower at Maslinovik, overlooking Stari Grad Plain. Stari Grad Plain is a near-unique monument, and a very extensive one. There is an exhibit and information centre devoted to the Plain in Stari Grad Town, complementing its two archaeological collections, and we recommend all of them highly. The best way, however, to appreciate the Plain and engage with it is to walk through it – that’s what we do on our Walking and Cruising Southern Dalmatia tour. Another form of engagement is to go to one of the lovely konobas, the traditional Dalmatian wine-and-food places, and consume the Plain’s very produce, hosted by – and perhaps conversing with – the very people that maintain it. You can find a few of them scattered within the Plain, and some more in the villages surrounding it. We’ll show you our favourite one on our Gastronomic Cruise in Southern Dalmatia. Soapbox: come and see Stari Grad Plain! A simple relief of a boar, or maybe a bear, or perhaps a dog, probably from the earlier Middle Ages, above the entrance to the chapel of Saint Helena in Stari Grad Plain. Let me add a personal note: if you are visiting Hvar and even if you have no specific intention to do so with Peter Sommer Travels, please consider visiting Stari Grad Plain – you will not regret it. In winter, there is a crisp clarity to the scenery and farmers are busy pruning their vines; in spring, wild flowers make some the fields a mosaic of colour and the whole place smells of new beginnings; in summer, the stupendous sunshine of the Dalmatian Coast bathes the Plain in brightness and the buzzing of bees, replaced by a balmy early evening calm when time seems to stop and the local wine beckons; and in autumn there is first the grape harvest, the most active time in the Plain, and then a new game of colours, led and easily won by the grapevines in their reds and yellows. A sherd of a 4th century BC Attic (?) red-figure vase showing a lady carrying a decorated plate. 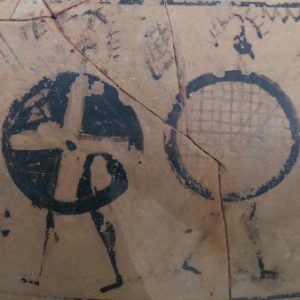 Shown in Stari Grad’s museum, it illustrates the contacts between Pharos and core regions of the Greek World of its era. More to the point, the Plain, a human-made landscape, is a most unusual piece of our shared human heritage and it deserves support and attention. Its scale reflects the bold ambition of the Greek settlers who created it, and its peaceful modest rhythm, still ongoing after all these years, reflects their intentions. It is one of Europe’s oldest living landscapes and we should cherish it and salute those who maintain it, their hard physical labour following that of their ancestors. Now, you see what I meant by my remark at the beginning. The Stari Grad Plain is “off the beaten track” insofar as it is neglected by the droves of visitors that come to Hvar every summer. Most of them never learn of its existence and – I fear – wouldn’t care to do so. As to the Plain’s actual tracks, they are about as well-beaten as any, having supported the day-to-day, season-to-season, year-to-year, generation-to-generation and century-to-century movements of local farmers for 24 centuries or about 100 generations!